Odnowiony apartament dwupoziomowy na najwyższym piętrze budynku w Lyonie, w samym sercu Starego Lyonu: mieszkanie jest przepuszczone, z drewnianymi podłogami, kominkami, balkonem z widokiem na Saone oraz w pełni wyposażone. Jest bardzo cicho i blisko do Hôtel de Ville, Place Bellecour i Place Saint-Jean. Mieszkanie jest dwupoziomowe: 5 piętro z sypialnią, salonem, kuchnią, łazienką i oddzielną toaletą. 6 piętro z sypialnią, pokojem dziennym - sala telewizyjna z projektorem wideo, łazienka z prysznicem i WC. Zawsze jestem dostępny (poczta, sms, telefon), jeśli potrzebujesz informacji w trakcie pobytu. Kot mieszka ze mną w mieszkaniu. Nie będzie go w trakcie pobytu, ale ważne jest, aby powiedzieć Ci, czy jesteś uczulony. 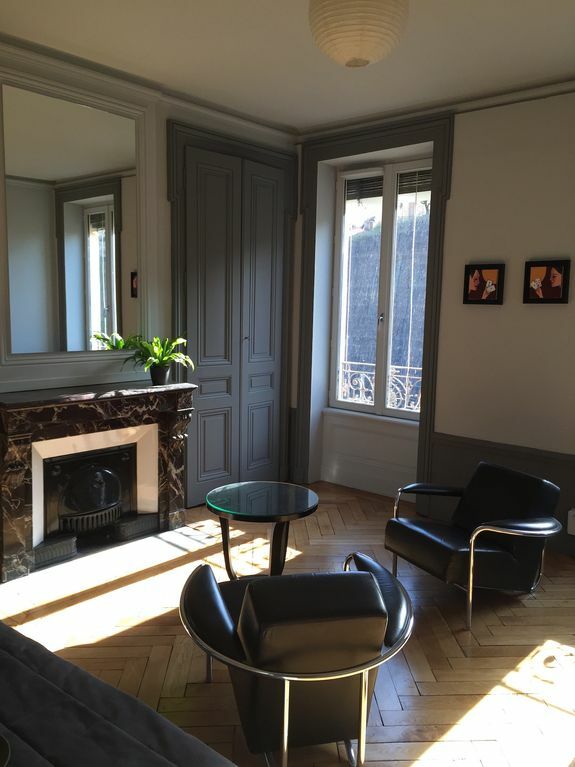 Great central location overlooking the Saône River, with easy access to the old city, Fourvière and the core part of the peninsula. Laurent was a helpful and gracious host who took time to acquaint us with the area, marking up maps and leaving us guide books to help us get around. The old building in which this apartment resides has a lift that opens right by the entry to the apartment. The apartment itself has a nice retro vibe on the spacious main level. The upper level, accessed by a steep and narrow spiral staircase is a more contemporary space with the bedroom, modern bath and lounge area. The large image projection TV and wonderful sound system made “movie night” an extra treat. Since we had a car, the included parking in a gated area at the rear of the building was a welcome addition. We booked this apartment last minute due to Hurricane Florence. Laurent was the best host. The couple that went with us arrived a day earlier than we did. Laurent was there for them. He stopped by twice to see how we were doing. Gave some great recommendations and even took one of our party and our luggage to the apartment we booked for the week. The location had a perfect view and was close to everything in the old city. The apartment was roomy and had everything you needed to cook and to entertain. The coffee maker was amazing. We would definitely stay again when we come to Lyon. Une grande place de parking d’accès délicat pour un véhicule de type 4/4 ( entrée très étroite ). Laurent est un hôte très sympathique et extrêmement réactif. Il vous conseillera sur les visites et les restaurants. Il laisse à votre disposition plusieurs guides sur Lyon. Donc excellente semaine. Que du bonheur ! We stayed in this wonderful, spotless apartment on the Saone River in Lyon Old Town for 3 nights in August. Laurent, our host, gave us great recommendations for restaurants, markets, and sights to visit while in Lyon. Everything about this apartment is perfect... the location, the architecture, the modern showers/bathrooms, the comfortable beds and furnishings, the modern fully equipped kitchen...It was a welcome and peaceful place to come back to after running around Lyon all day long. We would like to stay here again if we ever get a chance to return to this lovely city. We had a 2 night stay at this lovely apartment. Lauren was very helpful and gave us some good tips for restaurants etc. The apartment is very well equipped and very spacious. The only issue we had was that it was very hot in the attic room even with the windows open at night. It was hot whilst we were there but there is no air conditioning. Laurent’s apartment is beautifully renovated, with a wonderful, airy orientation to the Sãone river. We were a party of four adults, visiting Lyon with our adult son and daughter. We loved our stay in this very comfortable, well appointed apartment. Beds were very comfortable; the high quality espresso machine a favorite and Laurent’s kitchen in general very well-stocked. The location is perfect: close to the fabulous outdoor markets, steps to the busy old city but very quiet. Laurent is a very attentive and pleasant host and always available. Lyon is one of our favorite travel destinations and we hope to stay in Laurent’s apartment again.